Product prices and availability are accurate as of 2019-04-13 12:11:52 UTC and are subject to change. Any price and availability information displayed on http://www.amazon.com/ at the time of purchase will apply to the purchase of this product. 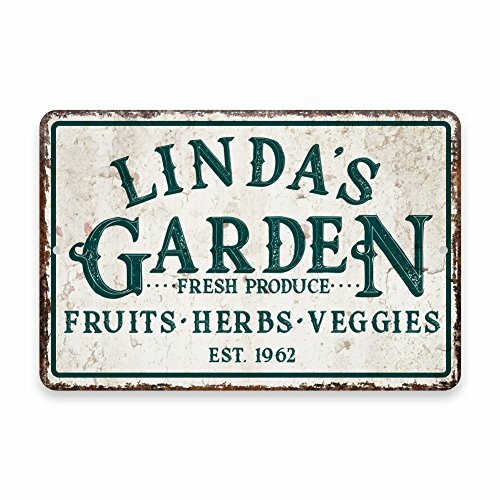 This charming vintage-look personalized garden sign lets guests know where they can find fresh fruits, herbs, and veggies! It is truly the perfect finishing touch any garden or green space needs for a fun, personalized feel! Featuring a cream distressed - rusty metal sign look, this new personalized metal sign adds the perfect vintage touch to your space. You can easily personalize the sign by selecting Customize Now and enter the text you would like. The sign is made of aluminum, measures 8" x 12" and can be used inside or outdoors. The image is on one side. The sign has two holes for easy hanging. Hanging hardware is not included. Personalized Metal Wall Sign - You add and can see the text in real time, select Customize Now Made of Aluminum with rounded corners and can be used inside or out. Two pre-drilled holes for easy hanging. Sign measures 8x12. 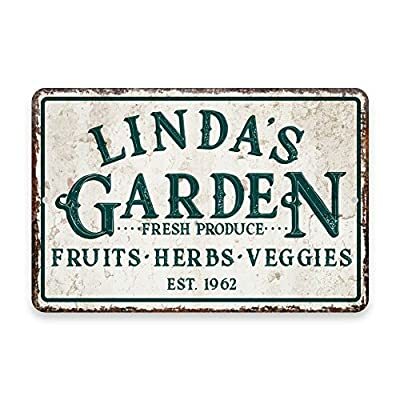 Some designs are landscape (12x8) and some portrait (8x12) The sign makes a fantastic personalized gift that everyone who loves gardening would enjoy. Made and printed in the USA and ships in 1-2 days from our facility in Houston, TX.